Om Mani Padme Hum! My neighbour’s cat died yesterday. Mikey was shy, seemingly indifferent and like most indoor-only cats he was fat because all he did was eat, sleep and hide under the sofa. I’m not too fond of cats but a few times when his owner was out of town, I would refill Mikey’s food and water bowls and clean his litter-box. So there was something like a personal connection and I was a bit sad when I heard he was no more. Immediately I had to think of what we would do when our dog dies. He is getting old for a dog his size. He doesn’t see so well anymore. The vet said he´d need a routine surgery to improve his vision. And although my mom insists he is just acting lazy, I suspect he doesn’t hear so well anymore either because when we call him, he often doesn’t react. We owe this four-legged friend who has been with us since he was an eight-week old puppy. Were it not for him, we would never be as active as we are as a family today. Through rain or snow, nothing keeps us from doing our walks three times a day, every single day we have lived with him. And due to him, our kids have always loved the outdoors. When they were barely two, they could easily do a steep two-hour hike up the hill without any fuss, which amazed even our hardy farmer relatives in Tibet during the kids’ frequent visits as toddlers – all thanks to our dog, their perfect walking companion. Recently, the Lama talked about the Six Realms into which one could be reborn and that the human realm was considered the most fortunate because only as humans could one actively work towards attaining Buddhahood and have the best chance of breaking the Samsaric cycle. In order to motivate us to diligently practice Dharma, he pointed out the rare opportunity humans have and contrasted that to the situation of animals. That it would be easy to fall into the lower realms at any point, so we should practice as long as we had the opportunity. Animals have a very poor chance even for achieving a better rebirth let alone attaining Buddhahood, the Lama continued. Dogs, he illustrated as an example, spend most of their day sleeping; their lives are driven by instincts and the chance to work on themselves and improve their lot was very limited. The only chance animals have for a better rebirth, the Lama pointed out, was through coming into contact with the Dharma. He then cited the funny story of a fly resting on a dry cow pat when it was flushed three times around a Stupa by heavy rain and as a consequence of the involuntary circumambulation, the fly could improve on its rebirth and came back as a human. 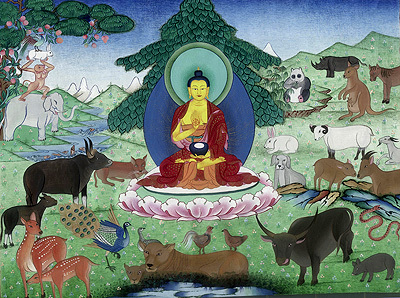 After I heard the Lama recount these animal tales, I began letting my dog sit with me in the prayer room in the mornings and started taking him along on occasional Kora in the hope that the circumambulations have a positive imprint on his mental continuum so he could be reborn as a human. I can’t believe I’m doing this. I feel a bit like one of those Lhasan Polas you can see on the Lingkor with some sheep on the leash liberated from the butcher and now faithfully sauntering along behind them. There were also these elderly Inji ladies who would bring their lap dogs into the temple during teachings. First I was put off by them. No decent Tibetan would ever bring something as dirty as an animal into a Lhakhang! That was just too unhygienic and disrespectful. But my view changed, as I began to understand the motivation of these ladies: All they were trying to do was give their pet a chance to “absorb” some Dharma for a better rebirth. So not only did I become more tolerant, but I too began bringing my dog into the temple even though he was bigger than those cute little Apsos and Spaniels one could tuck away into a handbag! Alas, we must have overdone it with our love of animals: one day the temple care-taker put up a “no dogs allowed” sign at the entrance. Some of my Tibetan friends say dogs here have a better life than many a poor person in Tibet. They say it in a way that you almost get the impression dogs shouldn’t receive all this attention. They are amused to learn that dogs here have ID cards, get annual medical check-ups, vaccines and if necessary also surgery. But it’s not the fault of “privileged dogs” when some humans seem to have tougher lives than them. What to do? It’s all karmic after all, is it not? Rather than resent the “injustice”, better move on and do something positive to improve one’s future Karma.